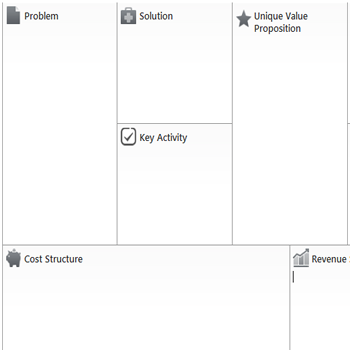 Lean Canvas is an adaptation of Business Model Canvas by Alexander Osterwalder which Ash Maurya created in the Lean Startup spirit (Fast, Concise and Effective startup). If you want to try it out without entering your email address, please use our public Lean Demo Canvas for a first impression. Alex Osterwalder’s Business Model Generation is a great hit that illustrates a range of planning and marketing strategies for competitive and business success. However, more ideas have come up from this model, among which is the Lean Canvas by Ash Maurya. While the Business Model Generation applied the methodologies used by Skype and Apple to attain product success in the market, the Lean Canvas concentrated on the way timeline affects the revenue stream of a business. It is therefore more target-specific and incorporates both small and large businesses effectively. It is a perfect model which took a few months to rewrite. Problem- a problem box was included because several businesses do fail applying a lot of effort, financial resources and time to build the wrong product. It is therefore vital to understand the problem first. Solution- once a problem has been recognized the next thing is to find an amicable solution to it. As such, a solution box with the Minimum Viable Product “MVP” concept was included. Key Metrics- a startup business can better focus on one metric and build on it. The metrics include the range of products or services you want to provide. It is therefore crucial that the right metric is identified because the wrong one could be catastrophic to the startup. Unfair Advantage- this is basically the competitive advantage. A startup should recognize whether or not it has an unfair advantage over others. Key Activities and Key Resources- Ash found out that they were more outside-focused when gauged with the entrepreneur’s needs. They had also been covered in the Solution box. Customer Relationships- a deeply focused startup business should establish customer relationships from the beginning. As such, these were covered in the Channels box. Key Partners- Ash removed this category regarding the fact that most startups don’t require specific key partners when putting up because they deal in unknown and untested products. As such, it would be a waste of time trying to build such relationships.